Golfe Juan, located between Antibes and Cannes. Vallauris & Golfe-Juan is the capital of ceramic art and pottery in the heart of the French Riviera. It has strong historical links with Napoleon, Picasso and Jean Marais. 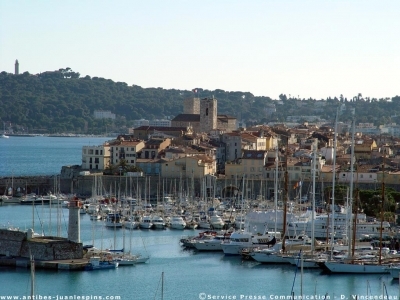 This is a small, traditional, community based Cote d’Azur town with sandy beaches and two bustling, busy ports. 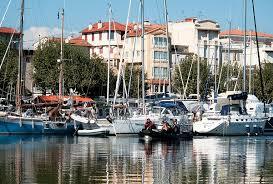 Golfe Juan remains essentially a small fisherman village by the sea, with a warm and relaxing atmosphere. You can’t help but fall in love with this place. The snack “Au bout du monde”: ideal for lunch, very good quality / price ratio. The snack has a terrace on the edge of the harbour overlooking the dive boats. It is right next to the dive centre. Chez Gigi: Italian restaurant on the harbour where the products are always fresh and good quality. The value for money is excellent. La Cigale du Golfe: Lebanese Restaurant. If you like vegetables and spices, that is for you! Antibes-Juan les Pins is one of the most well-known resorts on the Côte d’Azur, located between Nice (20 km) and Cannes (12km). Antibes has an interesting character mixing, events and innovation. The Cap d’Antibes is a small piece of paradise and provides a good walk by heading for the sign-posted path which follows the coastline. It is home to a number of millionaires’ chateaux, dream residences, and the famous “Eden Roc” hotel which is reputed to be the most beautiful hotel in the world and can be found at the point of the “Cap”. Juan Les Pins has a great atmosphere and buzzing centre, home to a number of great bars, nightclubs, restaurants and boutiques. Antibes equally has a great atmosphere, with a significant British influence. The Old Fort, the Picasso museum and the markets are other notable highlights. For over 40 years the legendary “Jazz à Juan” jazz festival has brought the stars to Antibes. It still goes on, and the famous pine trees lining the beachfront promenade are still the rendezvous for headlining Jazz musicians and the stars of tomorrow. Le Brûlot Pasta: Traditional Provencal and Italian cuisine, 3 rue Frédéric ISNARD, 06600 Antibes, +33 (0)4 93 34 19 19 WebSite. Albert 1er: Fish & Seafood restaurant, 46 Boulevard Albert 1er, 06600 Antibes, 04 93 34 33 54, Website. Lou Ciapacan: Modern Provencal & French, good value and good service, 17 avenue Doctor Dautheville, 06160 Juan-Les-Pins,+33 (0)4 93 67 07 82, Website. Le Pousse Pousse: Asian restaurant, 12 rue Docteur Dautheville, 06160 Juan-Les-Pins,+33 (0)4 93 61 41 99, Website. L’Absinthe Bar: 25 cours Massénat, 06600 Antibes. +33 (0)493349300, Website. The Blue Lady (English Pub): Rue Lacan, 06600 Antibes. +33 (0)493344100, Website. The Drinkers Club: 12 rue Aubernon, 06600 Antibes, +33 (0)493340812, Facebook Page. Le Crystal: Carrefour de la Joie, 06160 Juan-Les-Pins, +33 (0)4 93 61 02 51, Website. Strolling through the old town of Antibes and the Picasso Museum. A long walk around the Cap d’Antibes. Ferry day trip over to Les Iles de Lerins. Checking out the Superyachts on the International Yacht Club Quay at Port Vauban. Hire a Vespa in Golfe Juan and go exploring the Esterel and the Corniche d’Or. Heading for the hills, notably Gourdon, north of Grasse. Visit the Oceanographic Museum of Monaco.